Tipping point. Game changer. Momentum builder. Pivotal anchor. Those are some of the terms being used in reaction to Inmar Inc.'s decision to move its headquarters into Piedmont Triad Research Park and relocate the bulk of its workforce to downtown Winston-Salem. 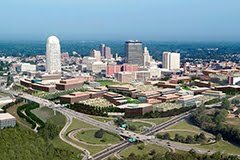 Winston-Salem business leaders called the move a major happening in a project that has been touted to be a key driver of the new Forsyth County economy. Inmar said Tuesday that the company was moving more than 915 present and projected jobs to two vacant former R.J. Reynolds Tobacco Co. processing plants. When Inmar moves into the renovated buildings in December 2013, it will become by far the park's largest tenant, potentially boosting the park's combined workforce to more than 2,300. Read more. Thanks for sharing excellent information. Your website is very cool. This website has got really useful info on it! All challenging to answer due to their number associated with remarks! Intended for illustration, in really 3 days or weeks, last January if we posted the particular video properly introducing watches, we had, a great deal more views! in only just 3 days, We have got seen how strong could possibly be impact having a real effective product. Merging beverages with repair has truly stoked the eye worldwide. If it is true, then that watch does in fact set itself as well as most replica chanel watches chronograph watches that will have its water reluctance ratings jeopardized if their particular chronograph components were used as you move watch seemed to be submerged.